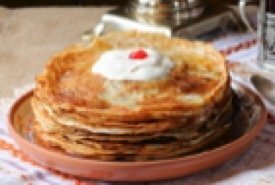 These traditional Greek dessert recipes are surprisingly easy to make and well worth the effort. Be sure to try the recipe for homemade Greek baklava; it's a definite winner! Also, the old fashioned spice cookies are simply delicious. 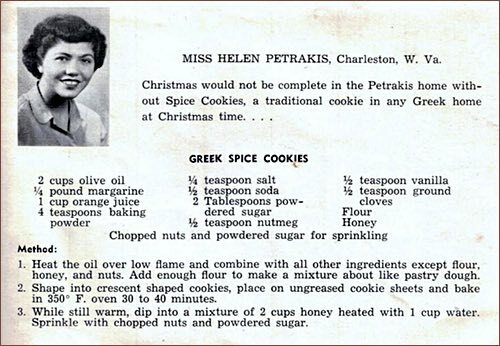 Christmas would not be complete in the Petrakis home without Spice Cookies, a traditional cookie in any Greek home at Christmas time. —Miss Helen Petrakis, Charleston, WV. 1. Heat the oil over low flame and combine all other ingredients except flour, honey, and nuts. Add enough flour to make a mixture about like pastry dough. 2. Shape into crescent shaped cookies, place on ungreased cookie sheets, and bake in 350°F oven 30 to 40 minutes. 3. While still warm, dip into a mixture of 2 cups honey heated with 1 cup water. Sprinkle with chopped nuts and powdered sugar. Mix 1/2 pound of butter and 1 cup of sugar to a cream; add 4 well-beaten eggs and the grated rind and juice of 1/2 lemon. Then stir in 1/2 pound of flour and work into a smooth dough. Lay on a well-floured baking-board and roll out thin. 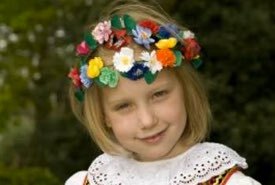 These are also sold on the street at the season, during Passion and Holy Weeks. 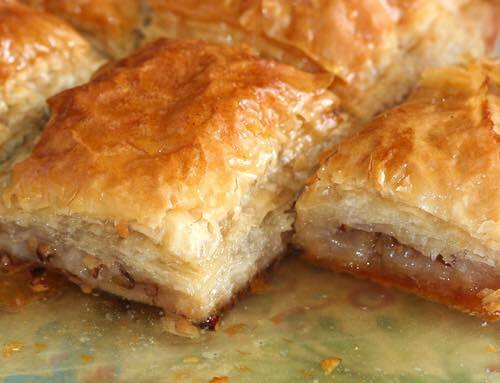 It's impossible to think of Greek dessert recipes without thinking of Baklava, and the version below is so easy to make. We're very grateful to Pam for sharing her favorite recipe with us. 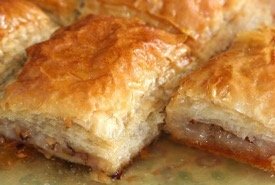 This is a Greek Baklava recipe that a friend of mine gave to me. I would definitely use store-bought filo (phyllo) pastry — I'm not that dedicated! ;-) However, there's a recipe for Filo Pastry included should you want to make it from scratch. Cut the filo pastry to fit the baking dish. 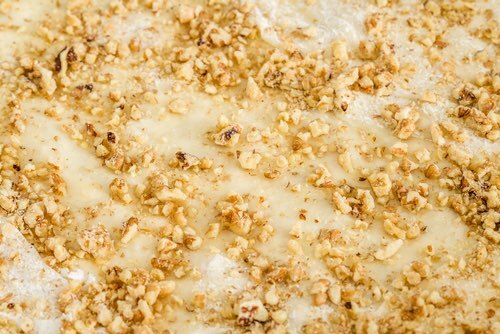 Place 2 sheets on at a time, brush with butter, and sprinkle with nuts for each layer. You will need about 12 sheets for each dish. Cut into serving pieces and then bake in a moderate oven (180°C) for about 45 minutes, until golden. Drain off the excess fat twice during baking. Prepare a syrup using the sugar, water, and lemon juice. Spoon this syrup over the baklava immediately after removing from the oven and draining off the fat. Mix all ingredients together and knead until smooth. Put dough aside and rest for 1 hour. Proceed to roll and stretch (beat with a rolling pin and lash against the table). 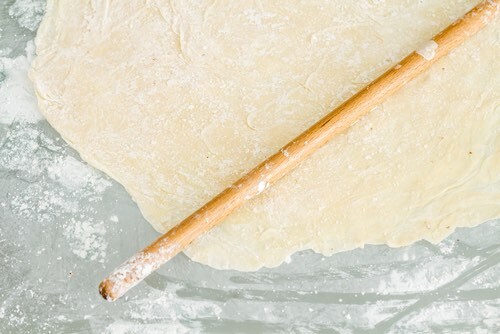 When the dough is paper-thin, brush it with melted butter before adding ingredients.